- The south of Onett is dominated by a gang of ruffians known as the Sharks. These punks regularly patrol the streets surrounding the Arcade, and will rush at you in packs if you approach their territory. It’s not a great idea to encroach on the Sharks’ turf until you’ve picked up better equipment from the Drugstore. - You’ll run into three types of enemies fighting the Sharks: Yes Men Juniors, Pogo Punks, and Skate Punks. All three are roughly the same strength, should take two hits to kill at this point in the game, and vacillate between doing nothing, hitting normally, and hitting hard. Their worst action, however, is calling in help, as you can quickly become overwhelmed. It’s a good idea to cautiously level on the Sharks out front of the Arcade until you reach level six, as you’ll be strong enough to progress - and you’ll probably get a few Hamburgers that will be handy for healing. - There are two permanent members of the Sharks wandering outside the Arcade whom you can fight or avoid as you see fit. Also out here is a trash can containing a Can of Fruit Juice. Frank is pretty much just a more-powerful version of the other Sharks, albeit without the ability to summon his minions. He’ll go at you with his knives, and if you’re lucky he’ll waste turns lowering your Guts. Meh. Attack him until he falls, healing when necessary. 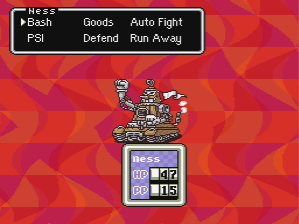 Another fairly standard battle, and even though Frankystein Mark II does more damage than Frank it also wastes a lot of turns spewing out steam. Wipe it out with normal attacks. 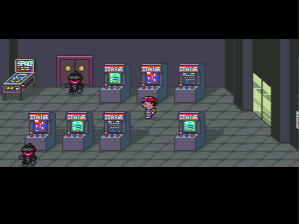 - Beating Frank will cause all hostile Sharks in Onett to disappear. This will satisfy Pirkle, the mayor, who will meet you in his Town Hall office. Agree not to hold him responsible in any way and he’ll give you the Key to the Shack. 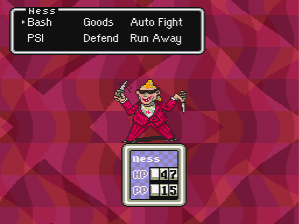 You can use this to reach the first proper dungeon in EarthBound.